In 2006, the Bluegrass Fire raced along Bluegrass Ridge, torching the subalpine forests above Elk Meadows on Mount Hood’s east flank. In 2008, the Gnarl Fire burned a much larger swath of the east slope, from just above Elk Meadows to the Eliot Branch canyon, nearly destroying century-old Cloud Cap Inn, Snowshoe Lodge and the historic structures at nearby Tilly Jane Campground. 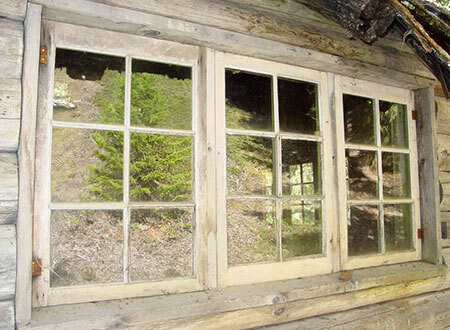 Heroic efforts by Forest Service firefighters spared these priceless jewels of Mount Hood’s history, with the fire burning within a few yards of these old structures. 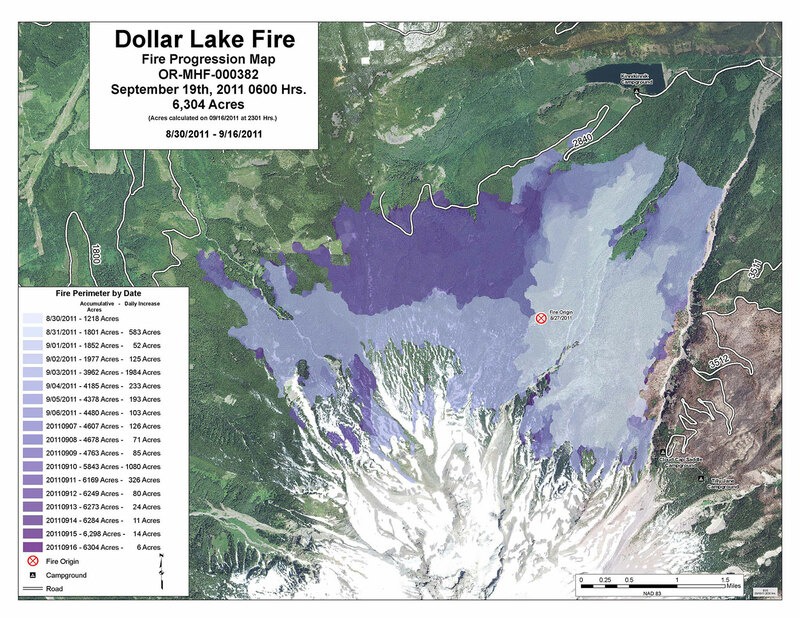 In August 2011, the Dollar Lake Fire was the third in a string of major fires that would ravage the slopes of Mount Hood in a period of just five years, this time burning the north slopes of the mountain. Lightning started the Dollar Fire started on a weekend, just below the popular Elk Cove trail and was immediately reported by hikers in the area. The Dollar Fire soon erupted to become one of the most fiercely fought and carefully documented fires in recent memory as it swept to the west, eventually threatening Bonneville Power Administration transmission lines at Lolo Pass and the nearby Bull Run Watershed, source of Portland’s drinking water. The fire wasn’t fully contained until the end of September of that year, eventually burning more than 6,200 acres of forest (maps and photos of the fire can still be viewed on the InciWeb interagency website). Firefighting efforts were initially slow to arrive at the Dollar Fire, and some (including the media and members of Oregon’s Congressional delegation) accused the Forest Service of purposely allowing the fire to grow because it was inside the Mount Hood Wilderness where it didn’t threaten areas open to commercial logging. But a subsequent investigation pointed to overstretched firefighting resources, a growing problem as the federal land agencies struggle to fund the spiraling forest fire phenomena across the west. By the time fall rains arrived, the fire had burned almost the entire north slope of Mount Hood, a 5-mile swath stretching from the Eliot Branch on the east to Cathedral Ridge on the west. Almost all of the burn was subalpine Noble fir forest, though a few old-growth mountain hemlock stands along the Timberline Trail were burned at Elk Cove and Cairn Basin. The eastern extent of the Dollar Burn contained large stands of Western larch, a fire forest species adapted to frequent, low intensity fires. Most of these trees did not appear to survive the fire, however, due to its extreme heat and intensity. In fact, very few trees survived the fire except along its margins, where a beneficial mosaic burn pattern left standing trees and some undergrowth to help begin the recovery phase. This is the new reality facing our forests, as a century of fire suppression continues to fuel catastrophic fires that completely destroy forest on a massive scale. The dense network of trails that cross through the Dollar Burn provide a front-row seat to how (and if) our forests recover from catastrophic fires inside a protected wilderness, without human intervention. In the immediate aftermath of the Dollar Fire, the picture was bleak. In the heart of the burn, the forest kill was nearly complete, as even the duff layer on the forest floor was burned away, exposing a thin layer of volcanic soils vulnerable to erosion. One of the first lessons of the fire was the importance of tree debris in stabilizing the unprotected soil. The living trees in this forest weren’t burned so much as boiled alive as their living cambium layer was superheated beneath their bark. The surprising result in the first season after the fire was scorched bark peeling away to reveal untouched wood underneath. The piles of peeled bark provided an immediate layer of mulch over the exposed soil, with smaller twigs and limbs also helping to form the beginnings of a new duff layer on the burnt soil. The roots of some understory plants in the worst of the burn zone also survived the fire, including huckleberry, beargrass and avalanche lilies. Two years after the fire, seeds blown into the burn began to establish, and the recovery was underway in surprisingly short order. Read more about the initial recovery in this 2012 WyEast Blog article. This year marks the five-year anniversary of the fire, and the recovery within the Dollar Burn is in full swing, though it will take a century or more for the area to fully recover – more on that in a moment. How does the Dollar Burn of today compare to the first summer after the fire? As the July scenes along the Vista Ridge Trail (below) show, the understory is recovering rapidly. In 2012, avalanche lilies sprung from bulbs spared by the heat of the fire, creating striking stripes of white blossoms and bright green foliage where these plants survived. A few beargrass (a close relative of the lily family) also survived, thanks to deep underground roots that escaped the fire. A few scattered huckleberry and other understory shrubs also sprouted from surviving roots in the first summer after the fire. In recent years, the beargrass and avalanche lily display in the Dollar Burn has become a spectacular attraction for early season hikers on the Vista Rigde Trail as these fire survivors continue flourish and spread in the bright new conditions. Other shrubby survivors, like huckleberry, have also continued to recover, thriving in the bright new conditions created by the fire. But the story in the last few years of the recovery has been the arrival of new plants in the burn zone, blown in by seed or deposited by wildlife. These include more understory species, but also the first few conifers to take root. This trailside log was a favorite resting spot for hikers on the Vista Ridge Trail before the Dollar Fire. Since the fire, hikers still rest here and have begun to polish away the charred surface along the top of the log – presumably with a charcoal backside as their souvenir! After five years, most of the scorched bark has fallen from the torched trees, and the trunks underneath have bleached from their initial golden shades of newly exposed wood to weathered silver and gray shades of a “ghost forest”. The standing ghost trees still retain a surprising number of their limbs, and perhaps more surprising, very few have toppled in the five years since the fire. This is testament to the fact that the core of these trees didn’t burn. 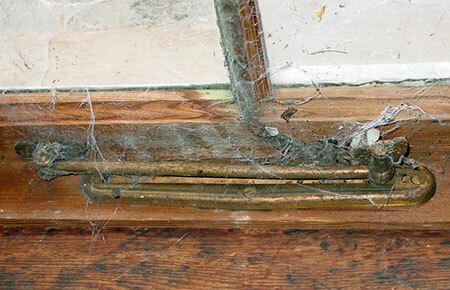 Most will stand for decades before insects and decay finally bring them down. A few trees in the burn zone were cut by firefighters in an attempt to create fire lines. Today, these cut stumps provide a look at the age of this forest. While the trees in the Dollar Burn aren’t particularly large by Pacific Northwest standards, they were actually quite old. The cut tree shown above was more than 300 years old and stump below is from a tree that had grown on Vista Ridge for 360 years! The extreme weather conditions and thin soils make for a hard life for subalpine trees, stunting their relative size compared to lower-elevation forests. The relatively modest size of these trees compared to their impressive age is another reminder of the vulnerability of our subalpine Noble fir forests that are still being logged commercially. While they continue to be “harvested” in unprotected areas under the premise of sustainability, these trees take centuries to reach a size worthy of commercial cutting, making the “harvest” more like mining than tree farming. The understory in the Dollar Burn is noticeably greener just five years after the fire, and a closer look reveals a handful of plant species doing the heavy lifting at this stage in the forest recovery. At the top of the list of pioneer species is fireweed, (described here in the previous article in this blog). True to its name, fireweed has evolved to be the first in line to resettle burned or disturbed areas. These plants produce massive quantities of winged seeds that can quickly reach very large areas. They are also hardy perennials with large root systems, so also play an important role in stabilizing exposed soil. In the Dollar Burn, fireweed has already colonized large areas, creating a spectacular flower displays from mid-summer through fall. Look between the drifts of fireweed and you’ll find other pioneers taking root. One surprising species is the diminutive wild dwarf bramble (sometimes called wild strawberry for its resemblance of its runners and leaves to domestic strawberries). These tiny plants are now found throughout the burn, threading through piles of bark and limbs. Huckleberries also continue their comeback, mostly from the surviving roots of established plants that grew before the fire but also as seedlings. In a few spots, the understory was not completely destroyed, and in these areas huckleberry is responding strongly to the bright conditions with abundant berry production. Though they were among the few understory survivors, the recovery of beargrass has been more gradual than expected. Most plants seem to be growing from roots that survived the fire, though the first big bloom of these survivors (and the seeds they produced) only arrived over the past two years. Clumping grasses have also arrived throughout the burn, as well as the occasional rush in moist, protected pockets. Elderberry is among the few woody understory pioneers to arrive in this stage of the Dollar Burn recovery. These plants are scattered widely, growing in less burned areas, and may also be growing from surviving roots. Conifers are just getting started five years after the Dollar Fire. Almost all of the conifer seedlings at this point in the recovery are Mountain hemlock and Noble fir, the dominant evergreens in Mount Hood’s subalpine forests. By counting branch tiers, a few young trees as old as four years can be found, but most are one or two year-old seedlings. But if you look closely, there are also many seedlings that have not survived the harsh summers in the burn zone, where there is little shade and the sandy mountain soils are extremely dry by the time rain reappears in the fall. This is the sorting process at work, where only a few seedlings will survive winter cold, summer heat and competition from understory plants to someday become part of the new forest canopy. Though most of the Dollar Fire was an overheated catastrophe for the forest, killing almost everything, there are a few spots where the fire cooled and burned in a “mosaic” pattern, leaving a few surviving trees and much of the understory. These areas are lush islands of life just five years after the fire, underscoring their importance in the recovery and why cooler mosaic burns can be beneficial to the long-term health of a forest. Pioneer species are much more abundant in heavily burned areas that are immediately adjacent to these surviving patches than in other parts of the burn, as plants quickly spread from these islands of green. While the Dollar Burn is recovering at nature’s pace, without human intervention, the Forest Service has given the nearby Gnarl Burn section along Cloud Cap Road a recovery boost by planting conifer seedlings. These trees were planting in 2010, about a year before the Dollar Lake Fire and following commercial removal of burned trees along the historic road. Today, these trees are thriving, and the main effect of replanting is the diversity of species, including lodgepole pine, western larch, Western white pine, Englemann Spruce and even whitebark pine at higher elevations. Noble fir and mountain hemlock do not seem to have been part of the replanting, perhaps because these species are the most likely to recover without human intervention. Hikers on the north side of Mount Hood will continue to have a front-row seat to the forest recovery in the Dollar Burn. Already, there are some surprising lessons. First, the main victims of blowdown since the fire have often been the few trees that survived the fire intact. This is because of the sudden exposure of their canopy to winter winds and snow loads, and is a surprising blow to the forest recovery these trees would otherwise be helping to seed the burn zone. The Dollar Burn generally stayed well below timberline (and the Timberline Trail), leaving most of the alpine zone intact. But where the fire did burn into places like Elk Cove, Eden Park and Cairn Basin, we will also have an opportunity to watch how alpine ecosystems react to fire. Some of Mount Hood’s most ancient forests grow in this zone, and have presumably survived because they are somewhat isolated from lower-elevation forests and often grow in moister conditions where snowpack is greater and summer days are cooler. But the forest could take centuries to recover in these areas, impacting the many species of plants and wildlife that live exclusively at this elevation. In human terms, it’s hard to see forest fire cycles in perspective, but in the case of the Dollar Burn, we have the benefit of early photographs from the area. 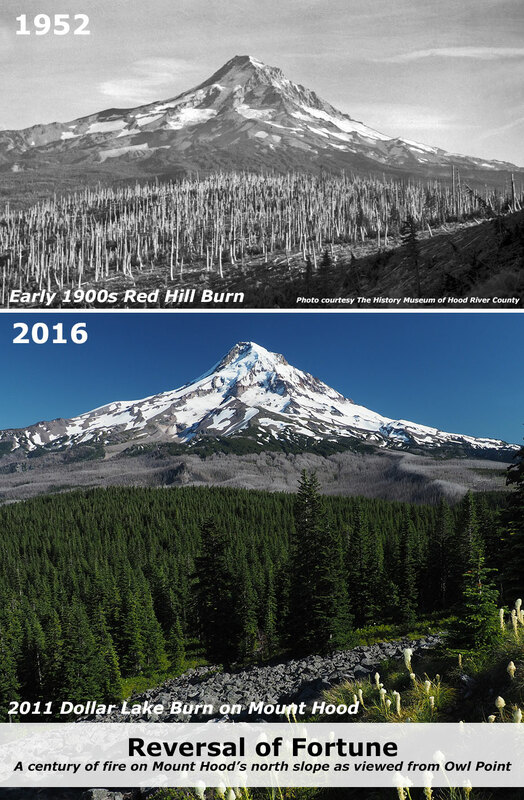 Forest surveys show that the Red Hill area on the north edge of the Mount Hood Wilderness burned in the early 1900s, and were barely recovering by the 1950s (see below). Today, the forest in this northern edge of the wilderness has substantially recovered after a century of regrowth, and now the view is reversed: the silvery ghost forests of the Dollar Fire now mark the once-green slopes of Mount Hood as viewed from Owl Point, while green forests and beargrass meadows cover the former Red Hill burn in the foreground. So far, so good, but the larger question in an era of climate change is whether our forests will continue to recover from catastrophic fire – or logging – in the way that we have always assumed they will. As the recovery unfolds in the Dollar Lake, Gnarl and Blue Ridge burns on Mount Hood we’ll learn how resilient our forests really are, and hopefully make better decisions in protecting them for the benefit of future generations. Hidden in plain sight at the foot of Mount Hood and the headwaters of Portland’s Bull Run watershed, Hiyu Mountain is a little-known, much abused gem. No one knows why this graceful, crescent-shaped mountain was named with the Chinook jargon word for “much” or “many”, and sadly, only a very few know of Hiyu Mountain today. This little mountain deserves better. 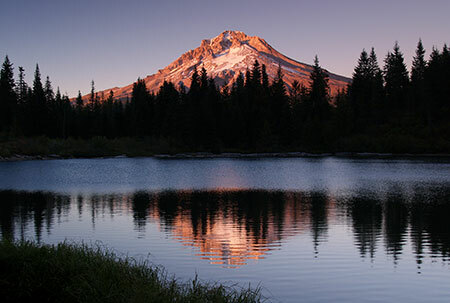 The broader vision of the Mount Hood National Park Campaign is to heal and restore Mount Hood and the Gorge as a place for conservation and sustainable recreation, ending a century of increasing commercial exploitation and profiteering. As part of this vision, Hiyu Mountain could once again become a place of “hiyu” beauty, where snowcapped WyEast fills the horizon and where Bull Run Lake, indigo source of Portland’s drinking water, could finally be seen and celebrated by the public these lands belong to. Hiyu Mountain rises 1,500 feet directly above Bull Run Lake, the uppermost source of Portland’s water supply. Lolo Pass is on the south shoulder of the mountain, connecting the Hood River and Sandy River valleys. The two sides of Hiyu Mountain mountain couldn’t be more different. The northern slope that forms the shoreline of the Bull Run Lake is almost untouched by man, almost as pristine as it was when the Bull Run Watershed was established in the late 1800s. Massive old growth Noble fir forests tower along these northern slopes, where rain and snow from Pacific storm fronts is captured, emerging in the crystal mountain springs that form the headwaters of the Bull Run River. Almost no one visits this part of Bull Run, save for an occasional Portland Water Bureau worker. This land has been strictly off-limits to the public for nearly 120 years, and remained untouched even as the Bull Run Reserve was developed as a municipal watershed. 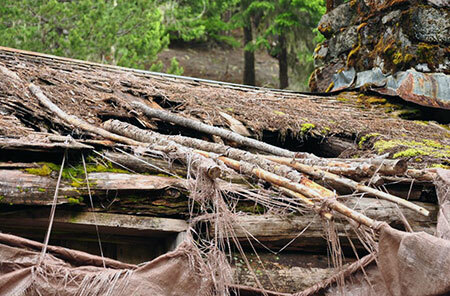 On the south slope of Hiyu Mountain things were surprisingly pristine until the 1950s. This area was also part of the original Bull Run Reserve, but was later ceded – in large part because the south slopes of Hiyu Mountain drain to the Clear Fork of the Sandy River, and away from the Bull Run watershed. Since the 1950s, a conspiracy of forces has almost completely altered the south face of the mountain and its summit crest. By the mid-1950s, the Forest Service had begun what would become an extensive industrial logging zone here, mining ancient trees in dozens of sprawling, high-elevation clear cuts in the remote Clear Fork valley. These forests will take centuries to recover, and are today mostly thickets of plantation conifers in woeful need of thinning. The maze of logging roads constructed to cut the forests are now buckling and sliding into disrepair on the steep mountain slopes. 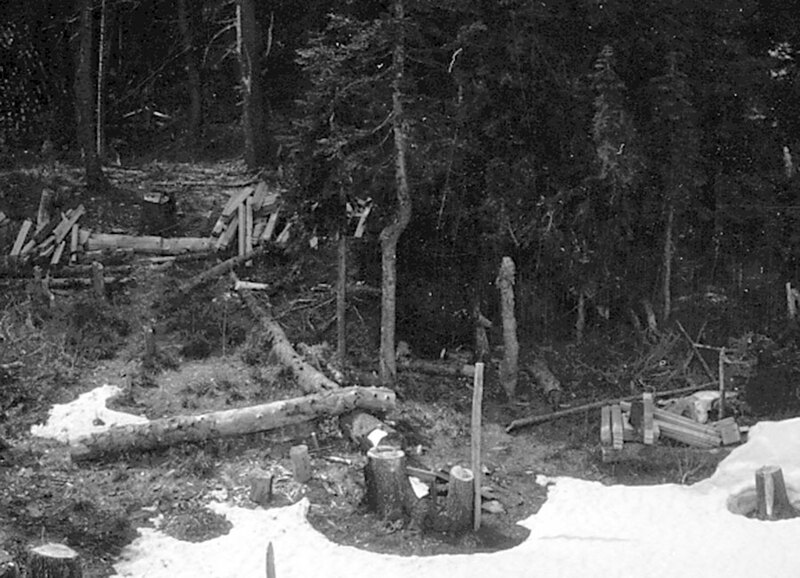 By the late 1950s, a logging road had finally pushed over the crest of Lolo Pass. At just 3,330 feet, Lolo is the lowest of mountain passes on Mount Hood and a route long used by Native Americans. But surprisingly, it was the last to see a road in modern times. The road over Lolo Pass coincided with the completion of The Dalles Dam in 1957, some 50 miles east on the Columbia River. While the dam is most notorious for drowning Cello Falls, a place where native peoples had lived, fished and traded for millennia, it also sent half-mile wide power transmission corridors west to Portland and south to California. Thus, the new road over Lolo Pass enabled the most egregious insult to Hiyu Mountain, with the parade of transmission towers we see today tragically routed over the shoulder of Mount Hood. The power corridor took advantage of the easy passage over Lolo Pass, an absence of tourists and public awareness (at the time) on this remote side of the mountain, and was built with complete disregard for the natural landscape. 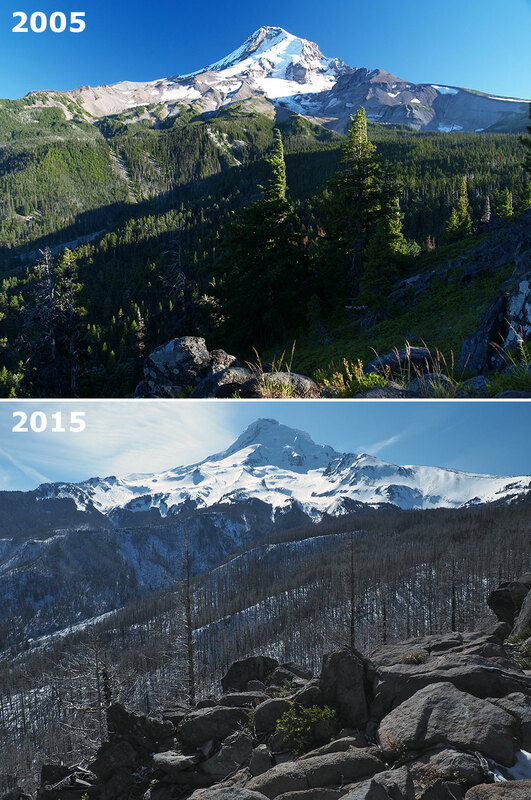 It remains as Mount Hood’s worst scar. Today, the south side of Hiyu Mountain remains a jarring landscape of ragged clearcuts, failing logging roads and the quarter-mile wide swath of power lines. With regular clearing and herbicides, the Bonneville Power Administration (BPA) ensures that nothing much grows under its transmission lines except invasive weeds. It’s a perpetual, linear clearcut that serves primarily as a place for illegal dumping and a shooting range for lawless gun owners who ignore (or shoot) the hundreds of BPA “no trespassing” signs. It is truly an ugly and shameful scene that cries out for a better management vision. By 1929, the Forest Service had built a 20-foot wooden lookout tower with an open platform atop Hiyu Mountain (above). It was an ideal location, with sweeping views of both the Bull Run Reserve and the entire northwest slope of Mount Hood. 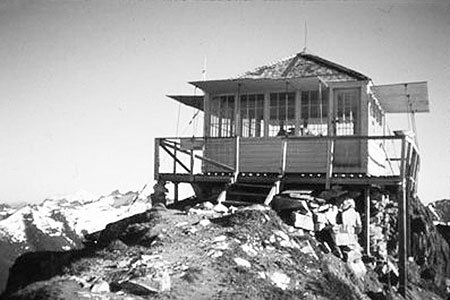 A roof was soon added to the original structure, but in 1933 a more standard L-4 style lookout cabin replaced the original structure (below). 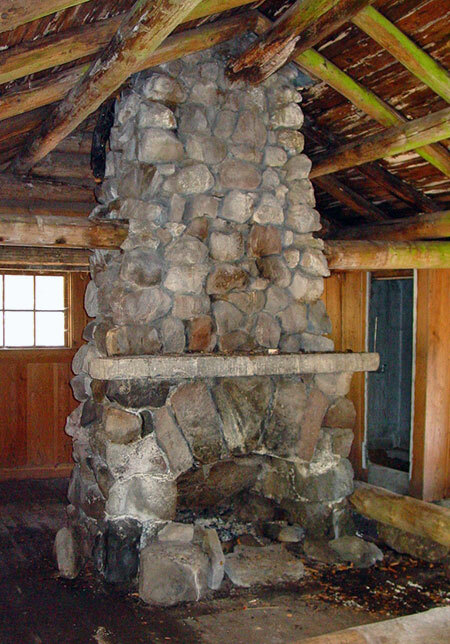 The new lookout provided enclosed living quarters for lookout staff, complete with a cot, table and wood stove – and an Osborne fire finder in the center of the one-room lookout. 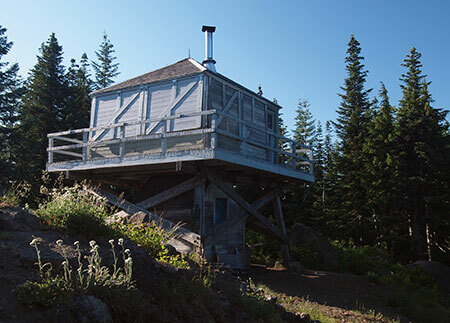 When the new Hiyu Mountain lookout was constructed in 1933, the Forest Service was also completing a comprehensive photographic survey from its hundreds of lookout sites throughout Oregon. These photos are now an invaluable historical record. Forest Service photographers used a special panoramic camera to capture the full sweep of the view from each lookout, creating a trio of connecting panoramas from each location. The following photographs are taken from a panoramic survey at Hiyu Mountain in 1934, and tell us what the area looked like in those early days. The first photo (below) looks north, toward Bull Run Lake, but also shows the fresh fire lane cut into the forest along the Bull Run Reserve boundary – visible on the right and along the ridge at the top of the photo. The fire lane is no longer maintained and has now largely reforested. The northern view also shows a simple wind gauge mounted on a pole below the lookout tower and the perfect cone of Mt. St. Helens on the horizon, as it existed before its catastrophic 1980 eruption. The view to the northeast (below) shows Mount Adams on the distant horizon, and a completely logged West Fork Hood River valley, below. The Mount Hood Lumber Company milled the old growth trees cut from this valley at the mill town of Dee, on the Hood River. 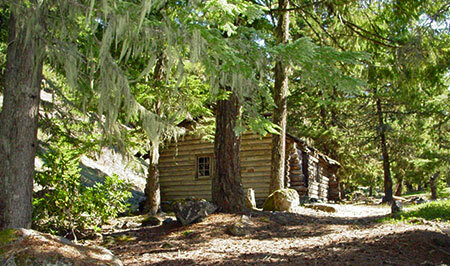 The ruins of their company town (and a few surviving structures) can still be seen along the Lost Lake Highway today. Trees cut in the West Fork valley were transported to Dee by a train, and a portion of today’s Lolo Pass road actually follows the old logging railroad bed. Unfortunately, much of the West Fork valley continues to be in private ownership today. Longview Fiber owned the valley for decades, but sold their holdings in a corporate takeover in the late 2000s to a Toronto-based Canadian trust. 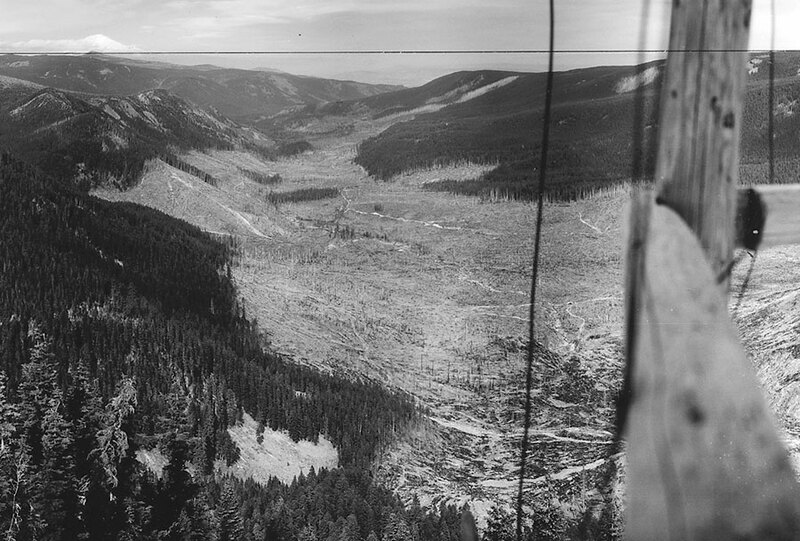 More recently, Weyerhauser took ownership of the valley, and has embarked on a particularly ruthless (and completely unsustainable) logging campaign that rivals the complete destruction seen in these photos from the 1930s (watch for a future WyEast Blog article on this unfortunate topic). To the southeast (below), Mount Hood fills the horizon in spectacular fashion, but there are some interesting details in the photo, too. In the foreground, the rocky spur that forms the true summit of Hiyu Mountain has been cleared to enhance the lookout views. The continued swath of logging in the West Fork valley can be seen reaching the foot of Mount Hood on the left. A detailed look (below) at the western panorama in the Hiyu Mountain series shows a lot of cleared forest, a necessity as the summit ridge continues in this direction for than a mile, blocking visibility for the new lookout. In this detailed scene, we can also see stacked logs and lumber that were presumably used to build a garage and other outbuilding that were added to the site in the 1930s. When it was constructed, the lookout on Hiyu Mountain was remote and reached only by trail. Materials for the new structured were brought in by packhorse. 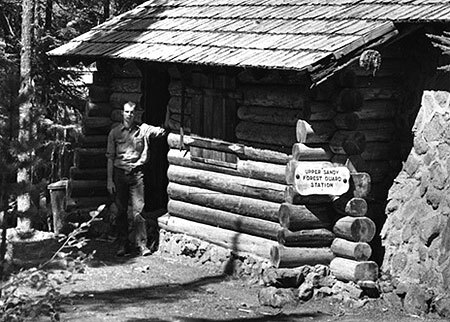 The nearest forest guard station was at Bull Run Lake, where Portland Water Bureau rangers staffed log cabins while guarding the water supply. A dense network of trails connected the Hiyu Mountain lookout to Bull Run Lake and other lookouts in the area. 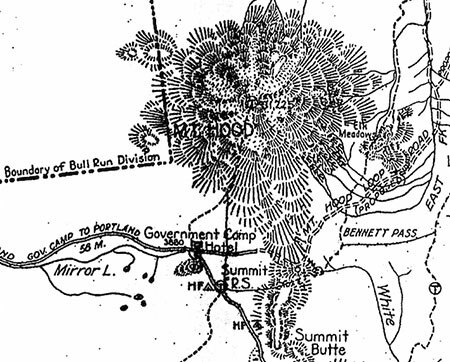 As the 1930s era Forest Service map (below) shows, a telephone line (the dash-dot line) also connected Hiyu Mountain to other lookouts on Hiyu Mountain and to the cabins at Bull Run Lake. The phone line north of the lookout followed the fire lane, and is likely still there, lost in the forest regrowth. 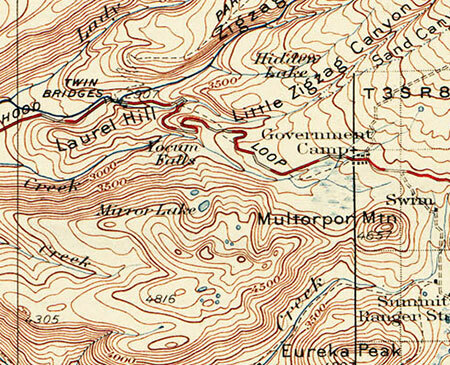 The 1930s forest map also shows the original alignment of the (then) new Oregon Skyline Trail, now the Pacific Crest Trail (PCT). 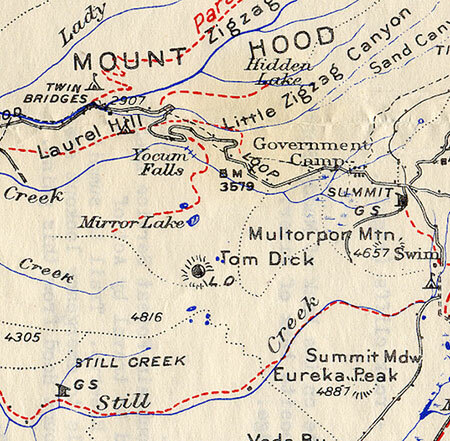 According to the map, the trail crossed right through the logged-over area of the West Fork valley (between the tributaries of Elk Creek and McGee Creek on the map) in the 1934 panorama photos, so not exactly a scenic alignment. 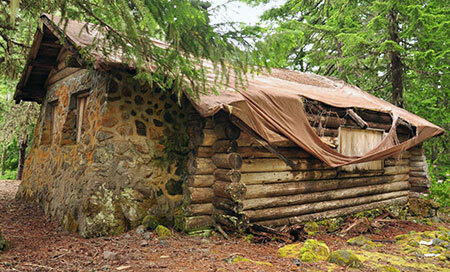 Today’s McGee Creek trail is a remnant of this earlier route from Mount Hood to Lost Lake. Today’s PCT stays near the ridge tops, roughly following some of the old forest trails from Mount Hood to Lolo Pass, then across the east slope of Hiyu Mountain, toward Sentinel Peak. 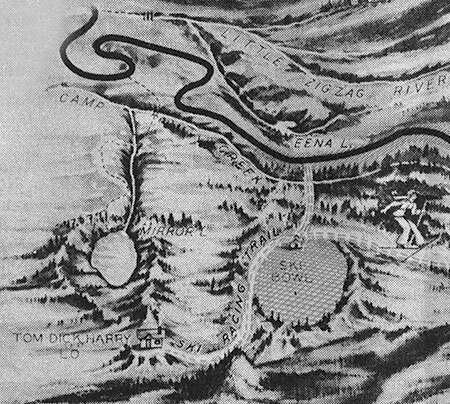 A 1946 forest map (below) shows the Oregon Skyline Trail to already have been moved to the ridges between Bald Mountain and Lost Lake, though the area was still without roads at the time. 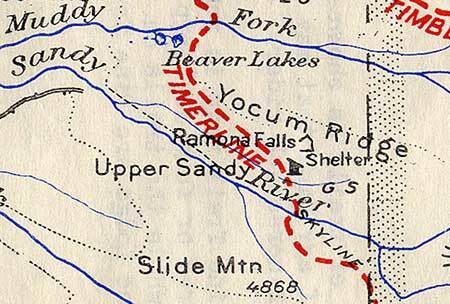 1946 forest map of the Hiyu Mountain area – oddly, Lolo Pass is not even marked! 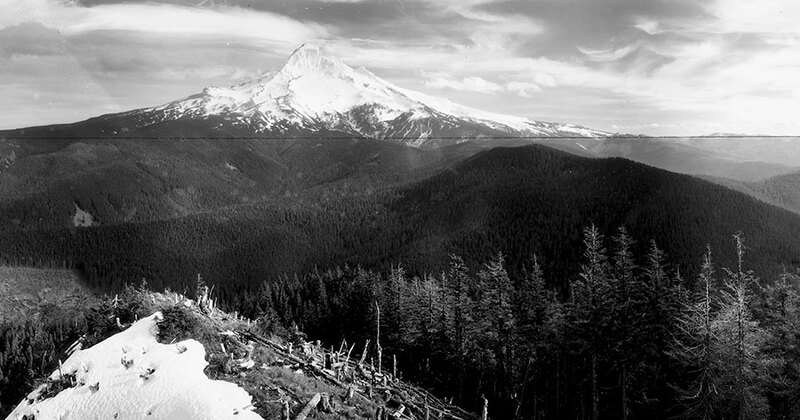 By the early 1950s, there were dozens of forest lookouts in the area north of Mount Hood, with structures on nearby Buck Mountain, Indian Mountain, Lost Lake Butte, Bald Mountain, East Zigzag Mountain, West Zigzag Mountain and Hickman Butte. All were within sight of the lookout on Hiyu Mountain, and must have provided welcome — if distant – company to lookout staff. 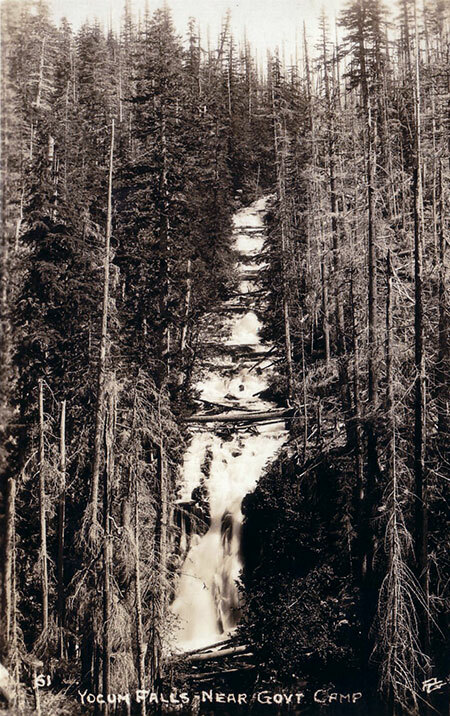 During the 1950s, roads were finally pushed into the Clear Fork valley and over Lolo Pass as the industrial logging era began on our national forests. 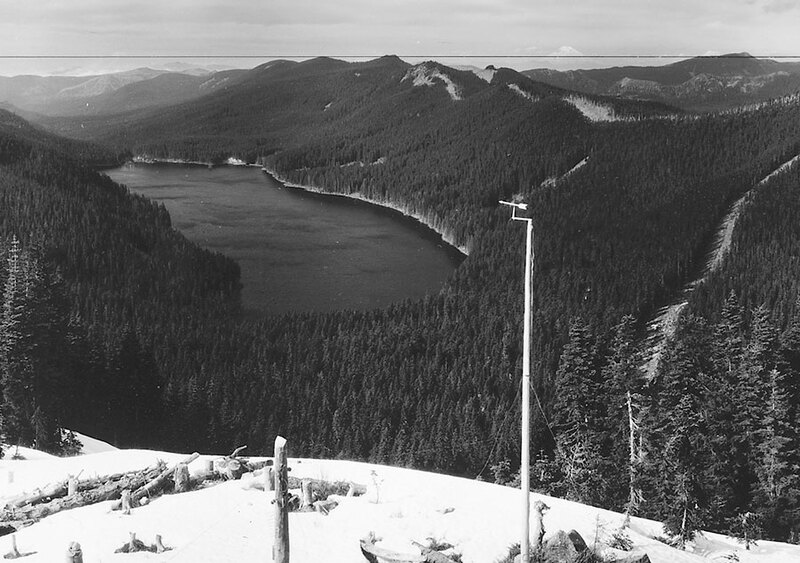 During this period, a logging road was constructed between Lolo Pass and Bull Run Lake, including a spur that climbs to the summit of Hiyu Mountain. 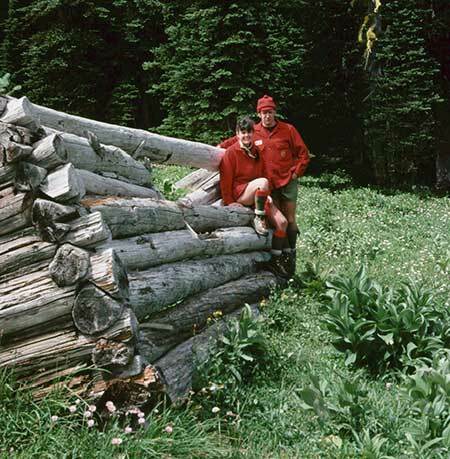 Though not widely known today, the logging agenda of the U.S. Forest Service from the 1950s through the 1980s did not spare the Bull Run Reserve. In the 1960s and 70s, alone, some 170 mile of logging roads were cut into the mountain slopes of Bull Run. By the 1990s, 14,500 acres of these “protected” old growth forests of 500-year old trees had been cut, or roughly 20 percent of the entire watershed had been logged. Public protests and legal challenges to stop the logging began as early as 1973, but only in 1996 did legislation finally ban the destruction of Bull Run’s remaining ancient forests. By the early 1960s, the Forest Service had begun to phase out the forest lookouts, and Hiyu Mountain’s lookout structure was removed by 1967. Since then, the main function of the summit road has been to log the south slope and summit ridge of the mountain and to provide access to radio antennas where the old lookout building once stood. The easy road access to the summit also brought one of Mount Hood’s seismic monitors to Hiyu Mountain in more recent years. As recently at the 1980s, it was still legal – and physically possible – to follow the old, unmaintained lookout trail from Lolo Pass to the summit of Hiyu Mountain. Sadly, the Forest Service has since officially closed the trail as part of their stepped-up campaign with the City of Portland Water Bureau to deny any public access to the Bull Run Reserve, even for areas outside the physical watershed. A few have dared to follow the Hiyu Mountain trail in recent years, and report it to be overgrown, but in excellent shape. The trail climbs through magnificent old Noble fir stands before emerging at the former lookout site. The route doesn’t come remotely close to the actual water supply in Bull Run, which underscores the ridiculousness of the no-entry policy. 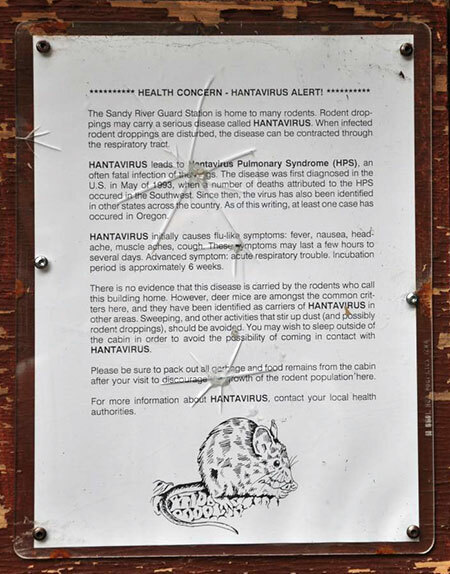 Meanwhile, in recent years the City of Portland has been forced to flush entire reservoirs at Mount Tabor and in Washington Park because of suspected contamination from vandals. Yet, these reservoirs continue to be completely accessible and uncovered and in the middle of the city, protected only by fences. Why so little security in the middle of Portland, where the actual water supply is in plain sight and easily vandalized, and so much security where there is little chance of coming anywhere near the water source? The answer seems to be a mix of dated laws, entrenched bureaucracy and a heavy dose of smokescreen marketing. Portland’s water supply has been under scrutiny by federal regulators in recent years for its vulnerability to tampering – or, perhaps more likely, natural hazards like landslides (Bull Run Lake was created by one, after all), catastrophic forest fires or even a volcanic eruption at nearby Mount Hood. This is because the water coming into city pipes is currently unfiltered. Portland’s elected officials are loathe to fund the price tag for modernizing the system to make it more safe and resilient. In their effort to avoid having to fund and build a filtration system, the City has instead relied heavily on the feel-good mystique of the Bull Run Reserve as a pristine, off-limits place where such measures simply aren’t needed. So far, Portlanders seem content to buy this excuse for preserving the status quo. That’s too bad, because it’s always shortsighted to exclude the public from access to our public lands, especially if the purpose is as important as ensuring safe drinking water in perpetuity. A New Vision for Hiyu Mountain? 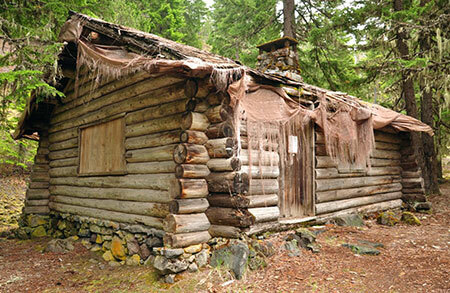 We already have a model for honoring Hiyu Mountain’s history at the Tillamook Forest Center, in Oregon’s Coast Range. This relatively new interpretive site is occasionally mocked for its prominent forest lookout tower without a view, but the purpose of the lookout is to educate visitors, not spot fires. Each year, thousands of visitors get a glimpse of how these lookouts came to be, and why they have largely disappeared from the landscape. A similar project could work at Hiyu Mountain, though a restored lookout tower there could be for the dual purpose of educating visitors on both the history of forest lookouts and the story of the Bull Run Reserve, with birds-eye view of Bull Run Lake from the tower. A restored Hiyu Mountain tower could also provide a more aesthetic alternative for mounting Forest Service communications equipment now installed on top of the mountain. The concept below would reopen the road to the summit of Hiyu Mountain to the public, with a restored lookout tower as the main attraction. 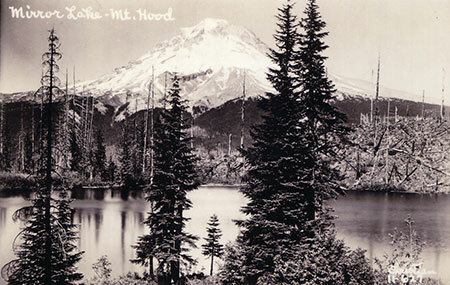 Visitors would have stunning views of Mount Hood and into Bull Run Lake. 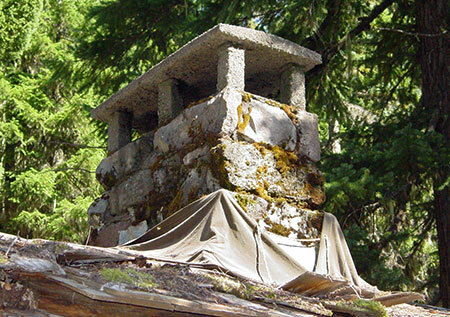 The old lookout trail from Lolo Pass would also be reopened, providing a way for more active visitors to explore the area and visit the restored lookout tower. This concept would not put anyone in contact with Bull Run Lake or any of Portland’s Bull Run water, though it would provide a terrific view of the source of our drinking water. It would also pull back the shroud of secrecy around our watershed that allowed hundreds of acres of irreplaceable Bull Run old growth to forest be quietly logged just a few decades ago – the very sort of activity the public should know about when it’s happening on our public lands. 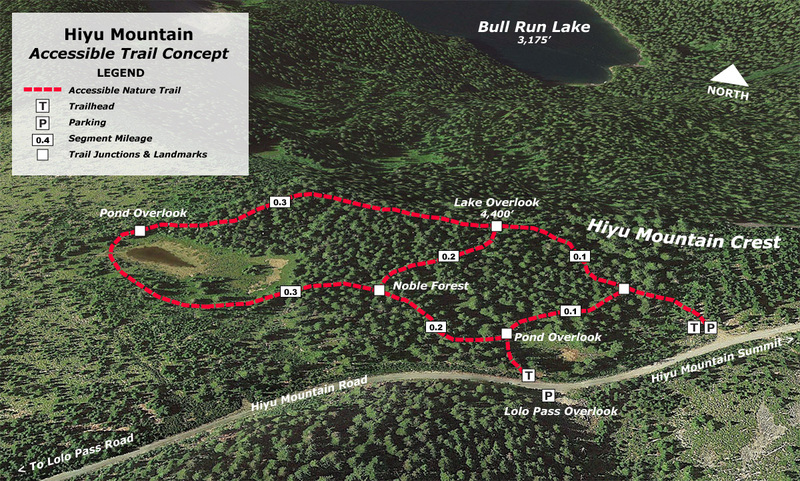 Another feature in this concept is an accessible trail (see map, below) to viewpoints of Bull Run Lake and a pair of scenic ponds that somehow survived the massive Forest Service clearcutting campaign on Hiyu Mountain’s crest. The idea is to provide much-needed trail experiences for people with limited mobility or who use mobility devices, such as canes, walkers or wheelchairs. Trails with this focus are in short supply and demand for accessible trails is growing rapidly as our region grows. Why build it here? Because everyone should be able to see and learn about their water source, regardless of their mobility. 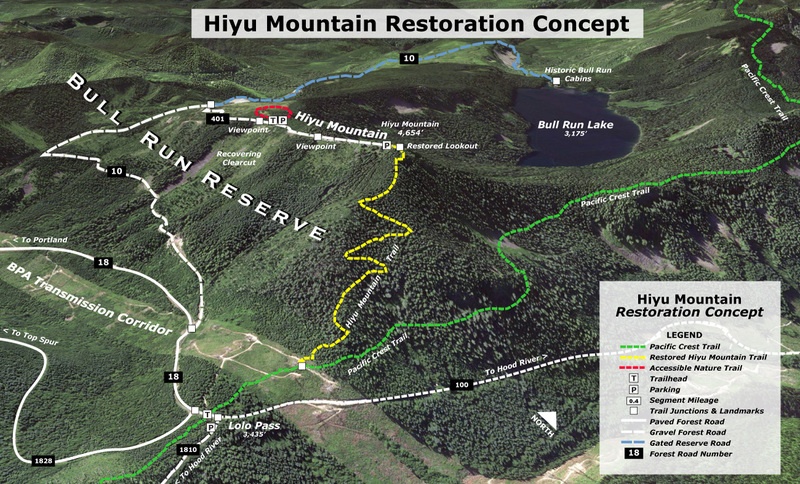 These recreational and interpretive features would also allow Hiyu Mountain to begin recovering from a half-century of abuse and shift toward a recreation and interpretive focus in the future. While logged areas are gradually recovering, the area will need attention for decades to ensure that mature stands of Noble fir once again tower along Hiyu Mountain’s slopes. What would it take to achieve this vision? The Hiyu Mountain lookout trail is in fairly good shape, and could be restored by volunteers in a single season if the entry ban were lifted. The concept for an accessible loop could be funded with grants that specifically target accessible trails if the Forest Service were to pursue it. And forest lookout organizations already maintain several historic lookouts in Oregon, so they could be a resource for recreating and maintaining a lookout at Hiyu Mountain. Most of the infrastructure is already in place, and just waiting for a better management vision for Hiyu Mountain. I’ve described one here, and there are surely others that could provide both public access and restoration. But only the U.S. Forest Service and City of Portland Water Bureau can move us away from the antiquated entry ban at Bull Run. Hiyu Mountain would be the perfect place to start! This is a two-part article that takes its name from Donald Shoup’s ground-breaking book “The High Cost of Free Parking”, first published in 2005. Shoup documents the many unintended effects of free parking in cities, and many of the principles could apply to our public lands, as well. The first part of this series examines the parking crisis facing the trailheads of the Columbia River Gorge and Mount Hood, while the second part will explore some possible solutions — none of them easy to realize until the true costs of free parking are confronted. 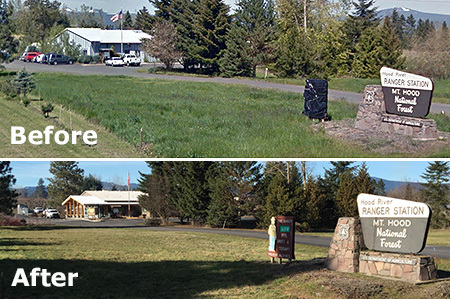 The Forest Service announced plans this month to redesign the huge parking area at the Dog Mountain trailhead, on the Washington side of the Columbia River Gorge, to address safety issues. The Forest Service plans to stripe the currently unmanaged, free-for-all paved shoulder with designed parking spaces for 75 cars. This is a significant reduction from the roughly 200 cars that pack into the trailhead on busy spring weekends. To compensate for the reduced parking, the Forest Service is teaming up with Skamania County’s Gorge West End Transit (WET) bus to provide a shuttle from Stevenson to Dog Mountain. The shuttle will run Saturdays and Sundays from April 16 to June 12, the peak season for the hike when the wildflower meadows that make the hike famous are at their peak. The shuttles will run 10 times daily from 10:15 a.m. to 4 p.m., and the one-way fare will be a modest $1.00. The predictable headline in The Oregonian story covering of the announcement screamed “Already hate parking at Dog Mountain? It’s about to get worse”, and the reaction from hikers in social media has pretty much echoed that simplistic, knee-jerk reaction. But will it really be worse? Seventy-five cars at the redesigned trailhead still translates into roughly 150 people on the trail at any given time — hardly a wilderness experience, and a huge improvement over the 400+ hikers you might currently expect along the 7-mile circuit to the summit from trailhead parking capacity, alone. Some hikers will use the shuttles, but more likely, people will simply go elsewhere — a point I’ll cover in the second part in this series. Hikers are usually people who love nature, so it’s fair to assume that few hikers would want to see their public lands trampled by unmanaged mobs. And yet, much of the reaction to limiting the number of cars that can park at Dog Mountain has been just the opposite — anger and outrage at any sort of limit on parking or access. So, why this disconnect? We’ll explore that question in the second part of the series, too, as well as the necessary solutions to overwhelming demand for trails in the Gorge and on Mount Hood in the second part of this series. First, a closer look at the problems that exist in today’s status quo. This isn’t fun for anyone. It’s a tragedy of the commons in the making, and tarnishes what could (and should) be a wonderful outdoor experience for people looking for some relief from their daily, urban routines. How did it get this bad? Rapid growth in the Portland metropolitan is part of the answer: while the Gorge trail system is only slightly larger than it was in 1940, the Portland-Vancouver region has exploded from just over 500,000 residents then to more than 2 million today. Compounding the growth is Portland’s emerging lifestyle economy, whereby new industries locating here are increasingly do so because their workers want easy access to our amazing outdoors. So, one answer is more trails — something I promote regularly in this blog, and something that can be done responsibly and in a way that greatly expands opportunities for people to have a positive outdoor experience. But getting there will take major reforms in how the Forest Service and Columbia Gorge Commission, in particular, think about recreation (both are surprisingly hostile to new trails) as well as restoring funds to gutted federal trail budgets. The federal budget problem is real: consider that Forest Service crews in the Gorge are now about one-fourth the size they were as recently as 1990, and the scope of the trail funding crisis is clear enough. Without volunteers from organizations like Trailkeepers of Oregon (TKO), Washington Trails Association, Friends of the Gorge and the Pacific Crest Trail Association our trails would literally be falling apart and impassable from fallen trees and slides. Mount Hood faces a similar backlog and dependence on volunteers to simply keep the trails open. A good share of the overcrowding and also comes from a failure of public land agencies to work together on common solutions. This is especially true in the Gorge, but also on Mount Hood, where the key players are the U.S. Forest Service, Oregon Department of Transportation (ODOT), Oregon Parks and Recreation Department (OPRD) and the Washington Department of Natural Resources (DNR) . Consider the trailhead parking policy along on the Oregon side of the Gorge: parking at Latourell Falls, Shepperd’s Dell, Wahkeena Falls, Multnomah Falls, Oneonta Gorge, Horsetail Falls, Elowah Falls, Starvation Creek and Mitchell Point is free, no permit required. Meanwhile, parking at Wahclella Falls, Bridge of the Gods, Eagle Creek, Wyeth and Herman Creek requires a Northwest Forest Pass ($30 annual pass or $5 day pass). 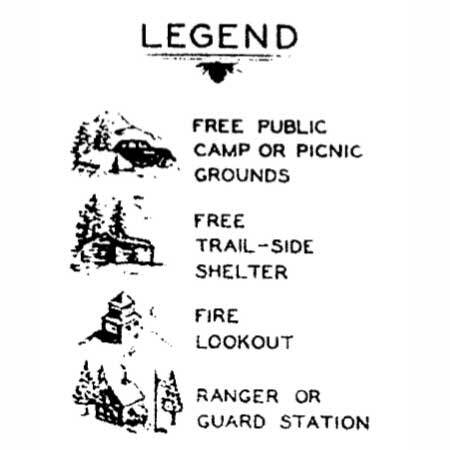 This can’t be explained simply by state vs. federal management differences, as the Forest Service operates several of the trailheads where free parking is provided, and the state operates both free and fee-based sites, with State Parks at Rooster Rock, Benson Lake and Viento requiring a $5.00 day-use free. On the Washington side, trailheads provided by the DNR at places like Beacon Rock and Hamilton Mountain require a special DNR permit ($30 annual pass or $10 day pass), while Forest Service trailheads like Dog Mountain require a Northwest Forest Pass. It gets worse: on Mount Hood, the Forest Service is well down the troubling path of commercializing both campgrounds and trailheads to “concessionaires”, who in turn, get to set their own fees for day use, which includes parking at trailheads. Several of these trailheads are also posted with a Northwest Forest Pass requirement, so it’s unclear if paying one is the same as paying the other, or even whether being ticketed by a “concessionaire” has any legal standing. Meanwhile, show up at the same trailhead on Mount Hood between November and April, and it might be a Snow Park site, which has its own permit, operated by the Oregon Department of Transportation ($25 annual or $4 day). Just to make things interesting, “agents” who sell Snow Park permits can charge an additional service fee — something you learn when you stop by one of the grocery stores or service stations that offer these permits. This amazing cocktail of free and permit parking is a major point of annoyance to hikers, both for the inherent confusion and the actual cost of buying multiple passes to use trails in the same area. That’s bad public relations for the land agencies and bad news for the public. But the tangle of policies and permits is especially bad for tourism, with visitors unfamiliar with the area forced to decipher these overlapping regulations. As frustrating as this crazy quilt of fees (or lack of fees) is for the public, the effect is worse when you consider that most of the permitting program do little to actually manage crowding and protect trails from overuse. Why? Because they are all flat fees that don’t recognize that demand for recreation fluctuates wildly by season and day of week on both Mount Hood and in the Gorge. The Forest Service will soon build this new trailhead for popular Mirror Lake – a chance to try a different parking approach? In The High Cost of Free Parking, Donald Shoup describes how building enough free parking to meet narrow peaks in demand results in oversized, mostly empty parking lots while promoting even worse crowding during peak periods. And yet, there are fairly straightforward tools for managing parking to avoid these effects on our cities. Much of what Shoup proposes for cities could be adapted for trails and other activities on our public lands, and that will be the focus of the second part of this series: a set of specific actions that could not only make the outdoor experience for everyone better, but also protect the scenery and trails that we go to the outdoors to experience, and ensure that is will still be here for future generations to enjoy. Good News from the Hood River RD! 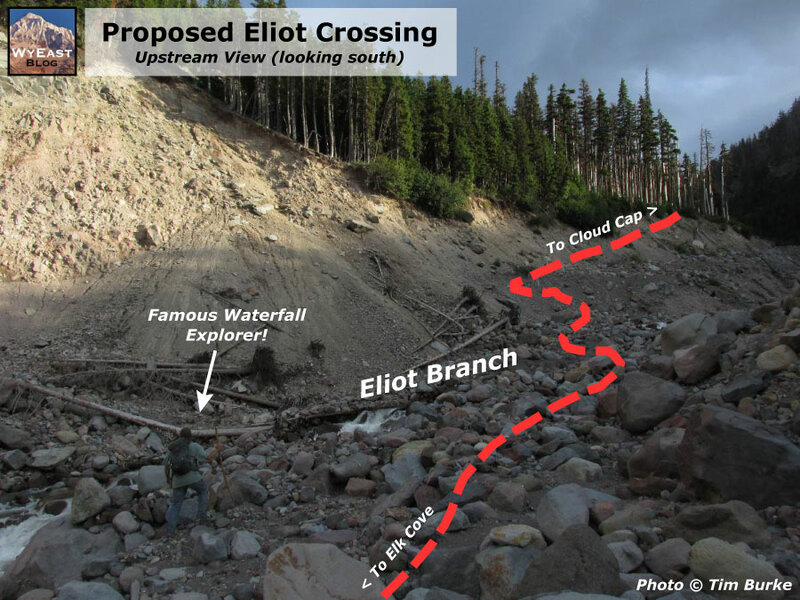 A few weeks ago the Forest Service contacted me about a recent article posted on this blog, It’s Time to Fix the Eliot Crossing! The article proposed some simple solutions for restoring a washed-out section of the Timberline Trail at the Eliot Branch, which has been offically closed for nearly a decade, and is quite dangerous for those who choose to ignore the closure signs. The article critiqued Forest Service inaction on the problem, and especially the agency obsession with the “million dollar bridge” solution of somehow installing a supension bridge over the disintegrating canyon of the Eliot Branch. 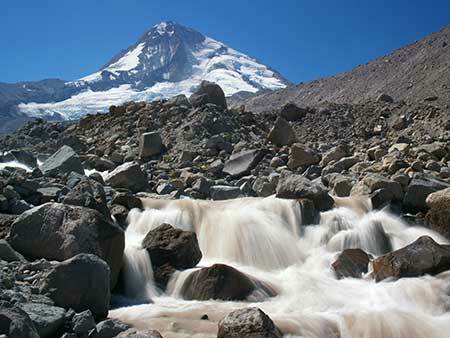 This stream is the unruly outflow from the Mount Hood’s Eliot Glacier, largest of the mountain’s glaciers. The proposed susppension bridge would have been prohibitively expensive, and had little chance of ever being funded. 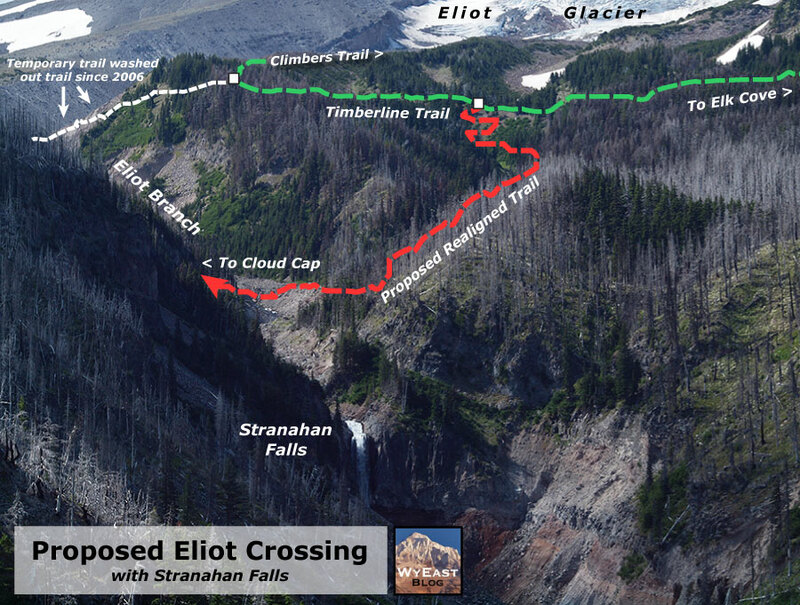 Worse, any bridge built here stands a very good chance of being destroyed: the steady retreat of the Eliot Glacier will continue to unravel the canyon below for the foreseeable future as the Eliot Branch carves into new ground once covered by glacial ice. Because of the critical nature of the article, I expected some grief from the Forest Service. Instead, I learned the Hood River Ranger District has now scrapped its “million dollar bridge” solution and is pursuing a simpler downstream crossing, very similar to what was proposed in the blog article. That’s great news! 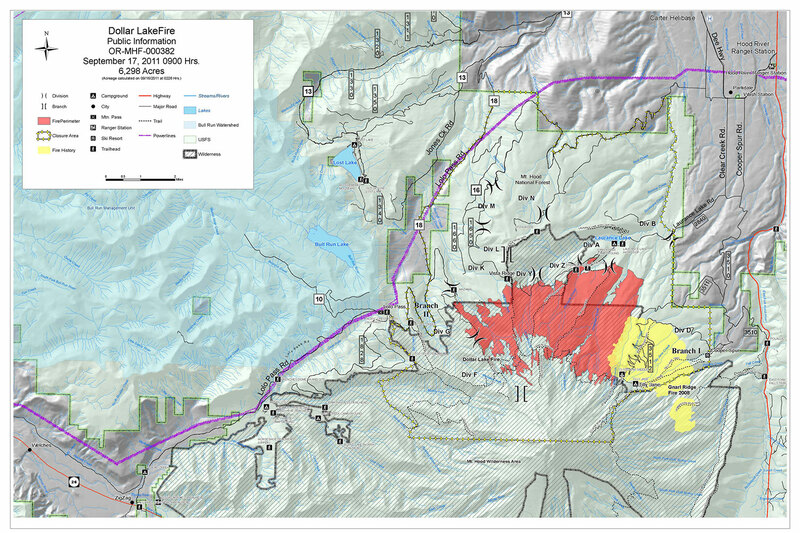 The Hood River District staff invited me to meet with them and have a look at their new proposal, so I sat down with one of their Forest Service planners in late December to hear the details. The following are highlights from that conversation. The conceptual Forest Service route would descend the east wall of the Eliot Branch canyon in a series of short switchbacks, just upstream from the ravine where the route was proposed in the blog article. Once across the Eliot Branch, the Forest Service route would traverse along the ridge that forms the west wall of the canyon, while the route proposed in the blog article followed a tributary stream up a ravine that leads to the Timberline Trail. The Forest Service route is a bit shorter, at 1.2 miles, but follows the same “keep it simple” principles laid out in the blog article. Here’s the best news: the Forest Service hopes to have the new trail under construction in 1-2 years, and have already begun scouting possible alignments. 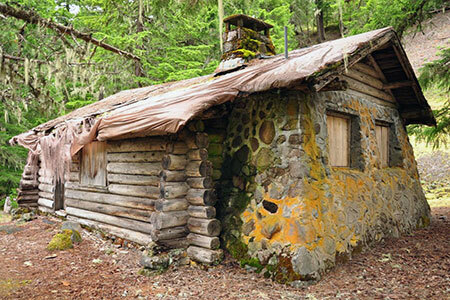 Even better, they hope to involve volunteers in some aspect of the construction, and have reached out to Trailkeepers of Oregon (TKO) to begin that conversation (note: the author is also active in TKO). This has been a long time coming, and kudos are in order for the Hood River Ranger District for getting this project unstuck — and especially for new staff at the Hood River office who have been instrumental in putting the “million dollar bridge” fiasco behind us. While much more work lies ahead for this project to become a reality, it’s a promising change of direction and a new level of commitment from Forest Service to finally fix this problem. I’ll post updates on the project here over the next couple of years as the details come into view, of course! 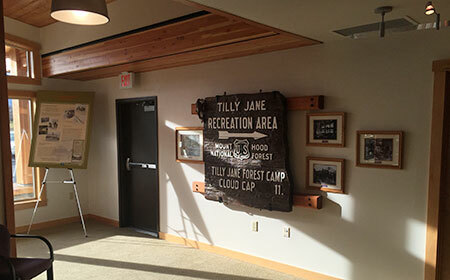 When I arrived at the Hood River Ranger District last December for the Timberline Trail meeting, I was surprised to see that the visitor facilities had been dramatically upgraded! This was to my chagrin, as I had lamented the need to do so in this blog article in early 2014. It turns out that the finishing touches to the remodeled Hood River offices were being made at about the time I posted those comments here, so a mea culpa is in order! 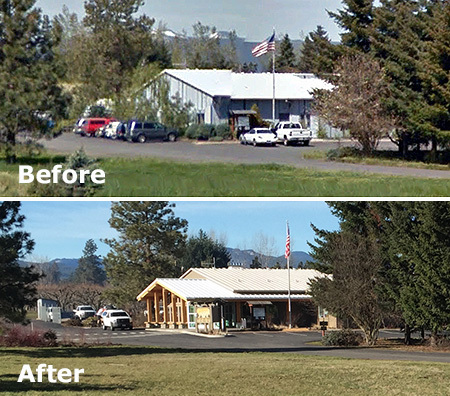 Like me, you probably won’t notice the changes to the Hood River Ranger Station when driving by on the Mount Hood Loop Highway, as the public face of the building has been redesigned to face south, not toward the highway to the east. In fact, the building looks much the same from the highway to the casual eye — though an addition to the main building, new signage and an outbuilding have been constructed in what was once a very large parking lot (see below). The new orientation makes perfect sense when you stand in front of the building, however. A picturesque view of Mount Hood rising above orchards fills the scene — a view echoed and embraced by the pyramid-shaped wall of windows that define the new visitor center. The revamped building exterior has ADA-compliant parking and ramps, a small plaza, updated informational sign kiosk, carved welcome sign, bike rack and a new pit toilet. 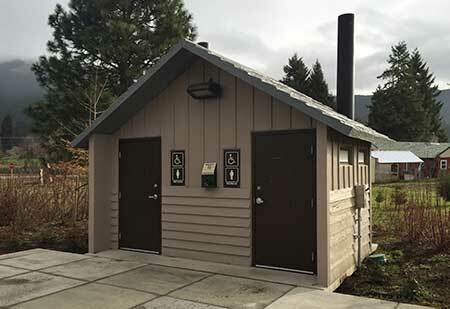 The latter is a much-needed addition that is less elegant than the flush toilets provided at the new Zigzag Ranger Station, but still a nice step forward. 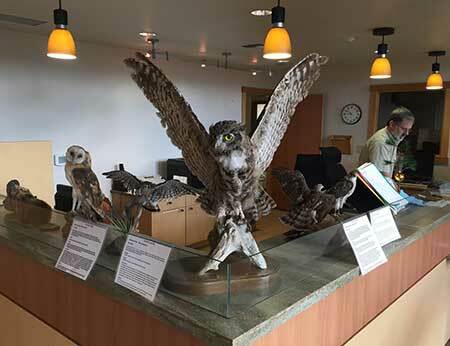 Once inside the new visitors center, you will find a main desk staffed by a Forest Service ranger, and a nice mix of interpretive displays, ranging from historical artifacts to a collection of mounted wildlife specimens found in the Mount Hood region. 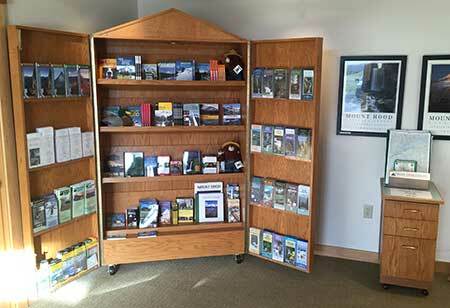 The center also has a very good selection of field guides and maps for sale, in addition to many free USFS informational materials. A nice touch inside the building is a terrestrial telescope mounted on a tripod in front of one of the large picture windows, allowing visitors to take a closer look at the mountain that looms above the ranger station. Watch out… bears lurk behind posts in the new facility! 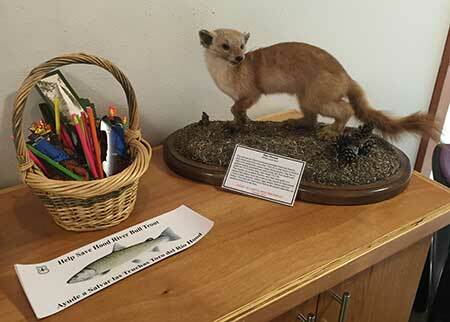 The wildlife specimens will be fun and informative for families visiting the center, as kids are universally drawn to animal displays. Each mounted display has a detailed info card to help parents become instant experts on the different species represented, or for older kids (and adults) to simply browse and learn from. 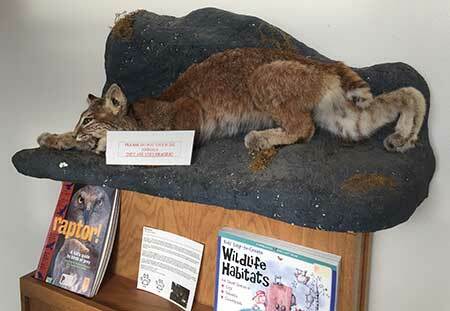 A particularly menacing bobcat is on display! The bookstore is located at the west end of the visitor center and creatively designed as a rolling, self-contained portable display. 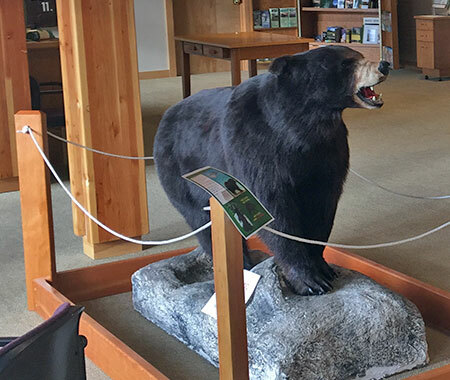 The book offerings are excellent, including many of the most popular regional hiking, climbing, skiing and snowshoeing guides, plus field guides to area flora, fauna and history. Posters and coffee-table books celebrating Mount Hood are also featured. 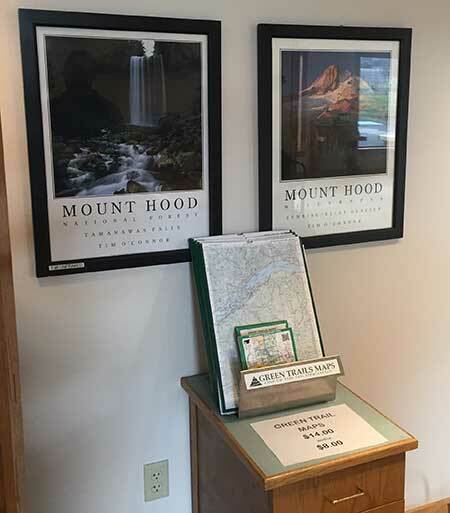 The map offerings in the rolling bookstore are also excellent, including USFS maps for most National Forests in Oregon and Washington, and official Forest Service maps for wilderness areas in the more immediate Mount Hood region. The map selection also includes several independently published trail and ski maps, including the exceptional National Geographic Trails Illustrated series for Mount Hood and the Gorge and maps for the Pacific Crest Trail. 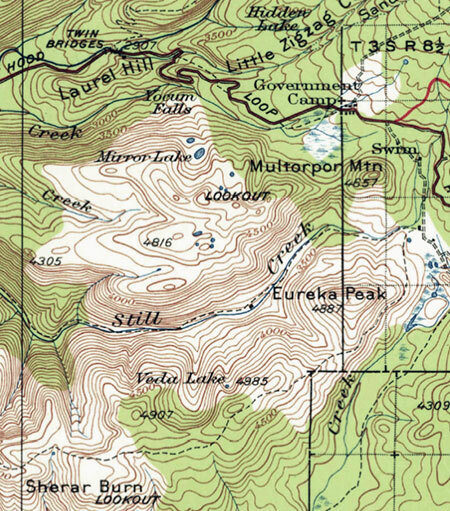 There are even Green Trails topographic maps for the Mount Hood region (below). Historical interpretation is somewhat more limited at the new center, anchored by a fine carved sign (presumably Works Progress Administration or Civilian Conservation Corps?) 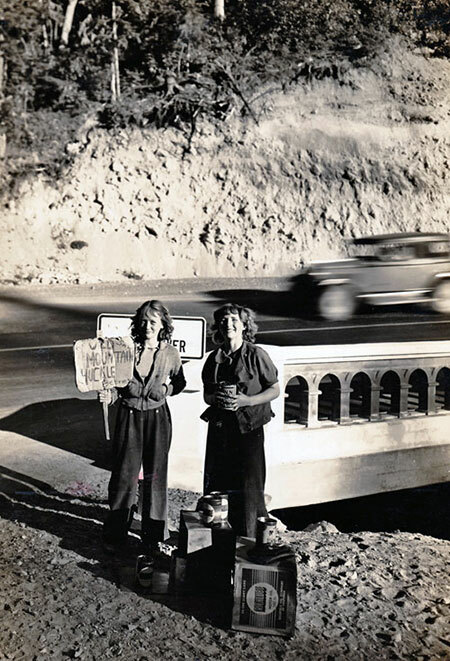 that once stood at the Cloud Cap junction on the old loop highway. The impressive old sign is flanked with captioned photos of north side history on the mountain. 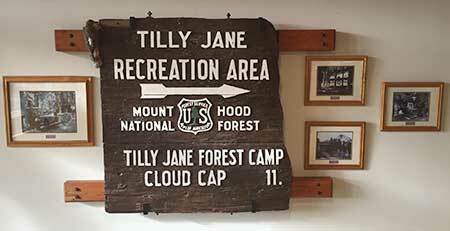 A mounted poster from the Mount Hood Scenic Byway series provides a bit more history of the Cloud Cap Inn and the early climbing history of the north side. 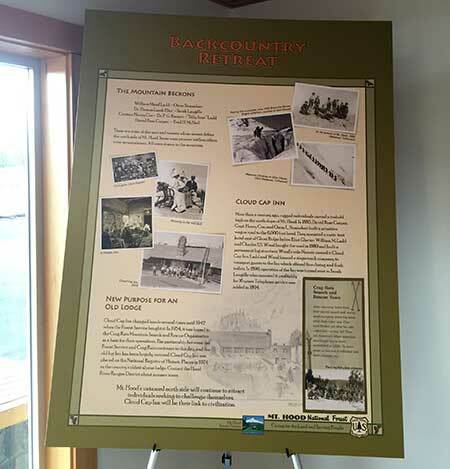 Hopefully, new displays will be added over time to explore more of the rich history of the upper Hood River Valley and north side of Mount Hood: the long Native American history in the area, settlement of the upper Hood River Valley in the 1800s, early Forest Service history on Mount Hood and completion of the Mount Hood Loop Highway in the 1920s are just some of the stories that deserve to be told here. 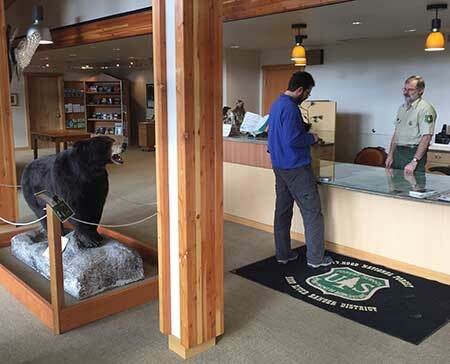 There are still some gaps in the visitor experience at the revamped ranger station that could use some attention. First, heavy landscaping hides the Ranger Station from southbound highway traffic (which is how most visitors travel to the mountain), and the signage along the highway is easy to miss. Adding a simple “Visitors Center” sign to the existing entrance marker would be helpful. 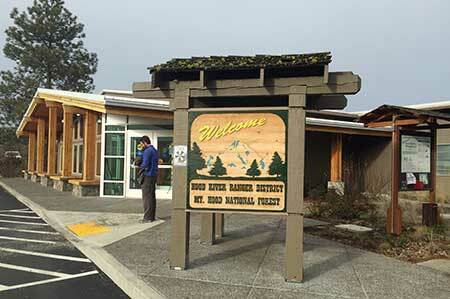 Second, the visitor center hours posted at the door differ from what appears on the official Mount Hood Forest website. 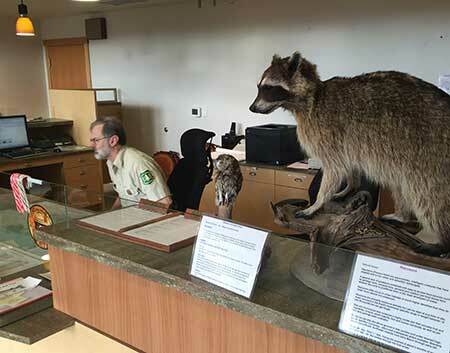 At least two variations appear on the website, depending where Google takes you: the main website listing shows a M-F schedule, while the dedicated Hood River Ranger District page includes Saturdays in the daily schedule. The signs at the main entrance to the Ranger Station split the difference, showing M-F hours, but extending to include Saturdays from Memorial Day through Labor Day. In all of these variations, the actual hours are the same: from 8:00 AM to 4:30 PM, closed on all federal holidays. 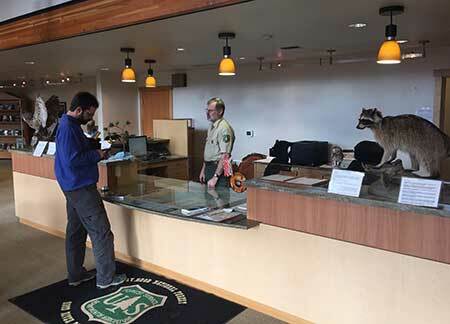 Obviously, Saturday operating hours are at a premium, both for the Forest Service in covering their expense of keeping the building open, but also for visitors, who are more likely to be traveling here on weekends than weekdays. Hopefully, the agency can someday find a way to keep the visitors center part of the Ranger Station open on Saturdays (and even Sundays?) year-round. Weekends are undeniably the busiest visitor time on the mountain, and Mount Hood is busy year-round. Closed mornings, evenings and weekends..? Finally, the pit toilets located outside the new visitor center are currently locked when the visitors center is closed — an unwelcome and unfortunate surprise for travelers who stop early or late in the day, or on weekends. In the long term, a better way to address the mismatch between federal government hours and those when the public is most likely to be recreating (weekends and holidays) would be to expand the outside informational and interpretive displays to better serve visitors when the main building is closed. This could even include locating interpretive displays some near the pit toilets, and leaving them unlocked on weekends and holidays. 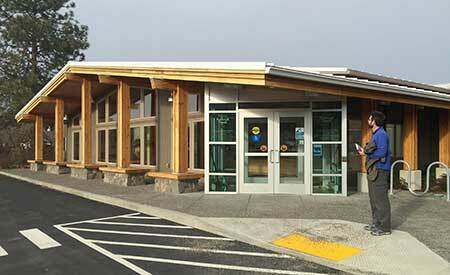 Despite these rough edges, the new visitor center really shines for the Hood River Ranger District. The new facility should greatly enhance the visitor experience for those seeing the area for the first time. 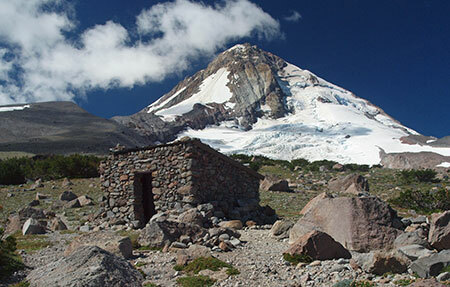 But even if you’re a seasoned Mount Hood hiker, the new center deserves a stop on your next trip through the area. Plan for 20-30 minutes to explore the displays and browse the books and maps. It’s Time to Fix the Eliot Crossing! Another hiking season has passed, marking eight long, inexcusable years since an intense November storm washed out the Timberline National Historic Trail near Cloud Cap in 2006. Since then, countless hikers from around the world have arrived at this world-class destination only to find cryptic temporary notices stapled to trailhead signs announcing that the segment of the trail crossing the Eliot Branch has been closed indefinitely by the U.S. Forest Service. 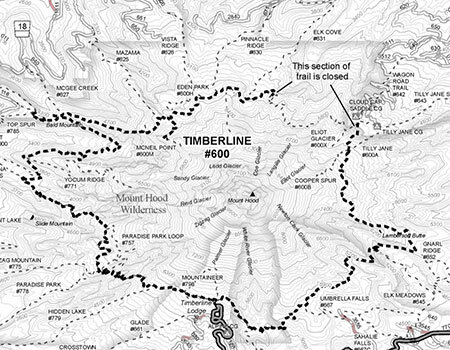 Most round-the-mountain hikers start at Timberline Lodge and hike clockwise, and therefore often learn of the Eliot Branch closure halfway through their 40-mile trek. Understandably, many of these hikers began working their way across the deeply eroded canyon in the years following the closure. Today hundreds of hikers each hear ignore the Forest Service notices and follow sketchy boot paths across the Eliot Branch to complete the Timberline Trail circuit. Why the delay in repairing the trail at the Eliot Branch? The Forest Service claims lack of funding, suggesting in 2010 that “studies were underway” for a million dollar suspension bridge at the current crossing location. Such a project would “require an appropriation by Congress” to fund, according to a Forest Service district ranger at the time. A second, more practical option under consideration was a significant reroute of the Timberline Trail at the Eliot Branch, which according to the Forest Service at the time, would require “constructing 1.5 miles of new trail to a lower crossing of the creek, then 1.5 miles back up to the existing trail”. 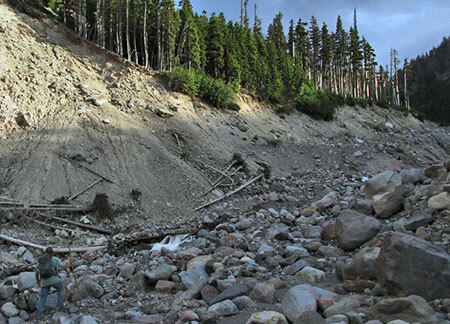 Eight years have passed since the 2006 washout, and four since the Forest Service last gave any indication of working toward a solution for the Timberline Trail. Since then, neither option proposed in 2010 for restoring the crossing has materialized. Instead, Oregon’s premier hiking trail remains an embarrassment, and a testament to the frustrating inability of the Forest Service to set agency priorities that match those of the public they serve. 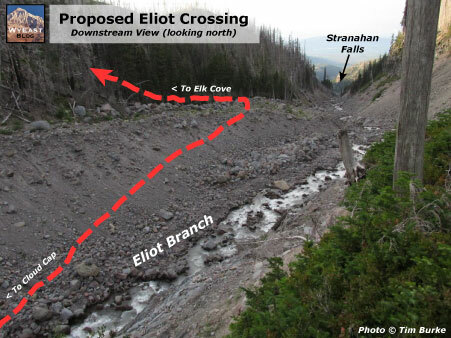 The 2006 flood event wasn’t the first time the Eliot Crossing had washed out in recent years. 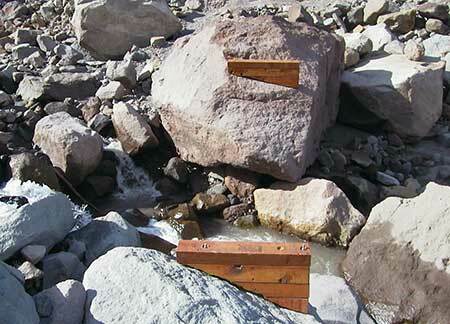 In the mid-1990s, a similar washout erased an earlier crossing that had been in place since the Timberline Trail was constructed in the 1930s. The Forest Service responded to the first washout by appropriating sections of a pair of climber’s trails that ascend moraines on both sides of the Eliot Canyon, and constructing a new crossing between the two trails, above the original crossing. This new crossing (pictured above) lasted only a few years, until the 2006 storm further deepened the Eliot Branch canyon, this time much more substantially. The new crossing featured a pair of bridge anchors bolted to boulders that straddled the Eliot Branch, and a seasonal bridge that could be placed on the anchors with a helicopter, similar to the Sandy River bridge near Ramona Falls. 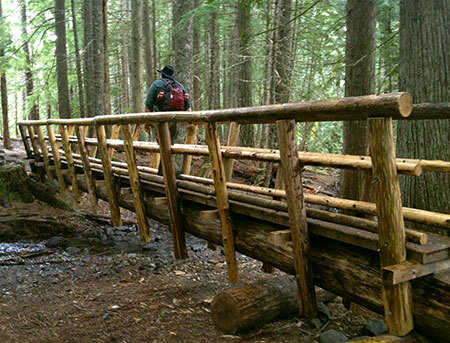 Removable, seasonal bridges are an excellent solution to the dilemma of keeping the Timberline Trail open in an era when retreating glaciers and increasingly erratic weather promises to continue deepening all of Mount Hood’s newly exposed glacial valleys. This point was underscored earlier this year when an unusually strong summer storm washed out the seasonal Sandy River crossing. 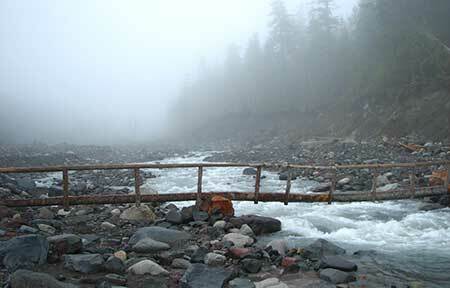 While one hiker was tragically killed in the incident, dozens were able to cross to safety because of the seasonal bridge. For this reason, studying elaborate permanent solutions, such as the “million dollar” suspension bridge, are an exercise in futility. Whole sections of the Eliot Branch canyon have collapsed into the stream over the past two decades during heavy flooding, and there is no reason to assume that this pattern won’t continue to rearrange the landscape for decades to come. This article proposes a more modest and immediate fix that mirrors the re-route option once considered by the Forest Service. This is a project that could have been constructed shortly after the 2006 floods with minimal cost and an excellent ability to adapt to future flood events. The Eliot Branch crossing is a perfect example of how the U.S. Forest Service and National Park Service differ in their budget priorities and working relationships with volunteers. It’s instructive to look at how the Park Service responded to the same 2006 storms and flooding that impacted Mount Rainier National Park. The damage to the 92-mile Wonderland Trail around Mount Rainier was exponentially worse than anything on Mount Hood. 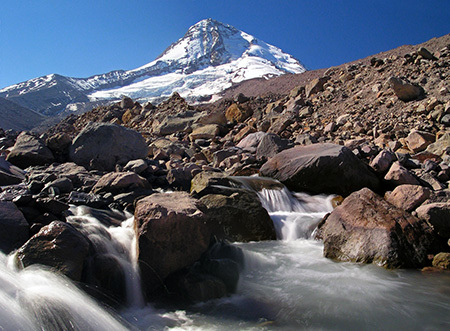 This is largely because several of Mount Rainier’s 26 glaciers dwarf even the Eliot Glacier, Mount Hood’s largest, and the Wonderland Trail has three times the glacial stream crossings of the Timberline Trail. 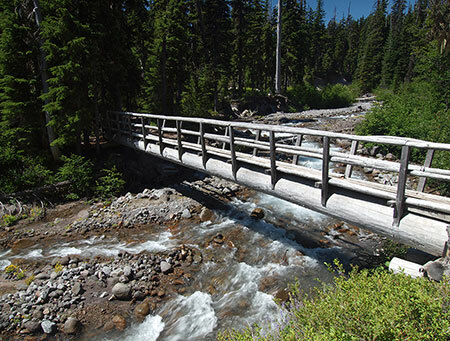 The Wonderland Trail not only crosses many more glacial streams in its circuit around Mount Rainier, it also has bridges across most of them, where most of Mount Hood’s glacial streams have no bridges (requiring hikers to ford most of the glacial streams). So, not only did the Park Service have a trail more than twice as long to restore, but also many times the number of bridges to repair along the Wonderland Trail. Despite the much greater challenge, the Park Service managed very little disruption for hikers. 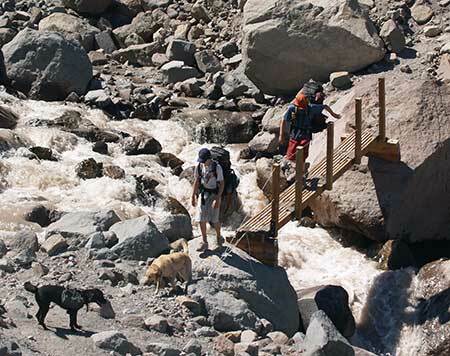 The Wonderland Trail uses a reservation system, and the Park Service took the precautionary step of not accepting reservations for the 2007 hiking season, in light of the scope of damage to many trail sections and crossings. 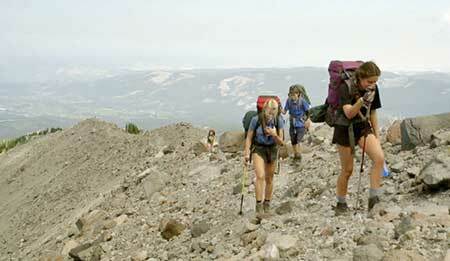 Yet, the Wonderland Trail was reopened to hikers on August 3, 2007, less than a year after the 2006 floods! 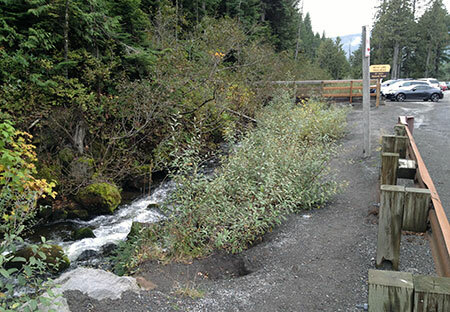 The rapid repairs to the Wonderland Trail happened because re-opening the trail was a top priority for the Mount Rainier National Park. To manage this feat, the staff enlisted some 1,700 volunteers in the effort, with tens of thousands of volunteer labor from organizations like the he Washington Conservation Corps and Student Conservation Association. The proposal described in this article for the Eliot Branch could easily have been completed in 2007, too, had restoring the trail been a priority for the Forest Service, and especially if volunteer labor had been tapped from any number of organizations involved in trail work in Oregon. Instead, the repairs have waited eight years, with no end in sight. It’s time to finally fix the Timberline Trail to ensure the safety of hikers determined to make the crossing, and to end the embarrassment of visitors to our region from around the world experiencing this national treasure in such a shameful state of disrepair. A Simple and Affordable Solution! The simplest solution to finally restoring the Eliot Branch crossing is to go lower and low-tech. 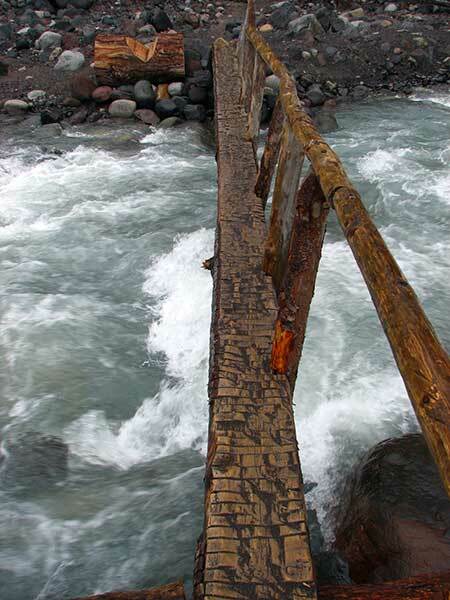 Instead of waiting for a dubious “million dollar” suspension bridge to be funded, a better option would be a new crossing downstream with a simple, seasonal plank bridge. Why go low? Mostly because the durable bedrock layers that form Stranahan Falls (located about a mile downstream from the current crossing) have also checked down-cutting of the canyon in that stretch by the Eliot Branch. Where the upper canyon has been carved some 150 feet deeper since the 1990s, the lower canyon section, just above Stranahan falls, shows much less erosion during this period. As shown on the proposal map (above), this new section of the Timberline Trail would depart from Cloud Cap Saddle trailhead, initially following a shallow ravine to the rim of the Eliot Branch canyon. The new trail would then switchback down the east wall of the canyon, reaching the new crossing (shown below) about 0.5 miles from the start of the new trail. The new, lower stream crossing would be similar to most other glacial fords on the Timberline Trail, except that a bridge is proposed here (as they should be at all glacial crossings on Mount Hood – watch for a future article on that topic!). This is in part because a bridge has traditionally been provided at this crossing, but also because the crossing location is very close to the Cloud Cap Saddle trailhead, and located at the wilderness boundary, so it would present fewer obstacles to build and maintain. Until the Eliot Branch settles down, however (and that could decades from now – or never), it makes sense to install a season bridge similar to that used on the Sandy River. From the proposed lower crossing of the Eliot Branch, the new trail would traverse along a side stream that enters the main canyon from the west, climbing approximately 0.8 miles to the resumption of the existing Timberline Trail. The 600-foot elevation loss (and subsequent gain) for this proposed new alignment of the Timberline Trail would be comparable to what was already required for the old, upper crossing, though the overall mileage of the new route would be slightly longer (by about 0.3 miles). However, the length of the proposed new trail would be less than half of what the Forest Service was considering for a lower crossing option in 2010. The key to the new crossing location is its proximity to Stranahan Falls, and the massive band of andesite bedrock that not only forms the falls, but also prevents further down-cutting in the area above the falls. As shown the illustrations (above and below), this location is the one spot in the upper reaches of the Eliot Branch canyon that has a reasonable chance of stabilizing in the near term. As an aside, the area near the brink of Stranahan Falls is arguably the most stable in terms of down cutting, with the streambed now scoured to bedrock for some distance above the falls. But a crossing here would not only add to the elevation loss/gain and distance for the new trail, it would also require some challenging trail construction in the very steep and complex terrain that surrounds the top of the falls. There are also additional waterfalls to negotiate in the area immediately above Stranahan Falls, including a 25-foot waterslide just above the main falls and a 35″ upper falls just upstream from the waterslide. While it would surely be a spectacular location for a trail crossing, it would also very difficult to build and maintain over time. A crossing at Stranahan Falls would also encourage more off-trail exploring of the falls area than is desirable, both for public safety and environmental concerns. So, based on these considerations, the crossing location proposed in this article seems to be the best spot for ensuring long-term stability and reasonably straightforward design and construction. Sadly, this fine bridge over Clark Creek is among the few surviving on Mount Hood, and the only surviving permanent crossing on a glacial stream. 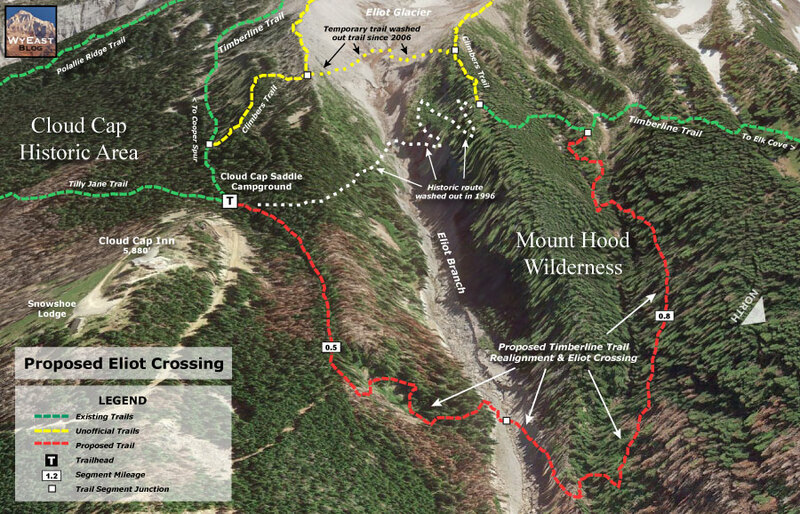 The total length of the proposed new Timberline Trail section is approximately 1.3 miles, with the first (and most rugged) half mile occurring outside the Mount Hood Wilderness boundary. This would allow for mechanized equipment to be used on that section of new trail, while only hand tools could be used to construct the sections west of the Eliot Branch, inside the wilderness. One Forest Service source (the USFS Trails Unlimited enterprise program) estimates the cost of building new trails to be between $2,500 to $12,000 per mile. That’s a big range, to be sure. So for the purpose of this article, I used the top of that range to put the cost of actually constructing the proposed trail at just over $15,000, given that the trail would involve both wilderness construction and steep terrain. Other costs would include environmental analysis (if needed – this proposal may qualify as a categorical exception), design and surveying. But even if these administrative and technical costs were to triple the cost of the overall project, restoring the Timberline Trail along this alignment might still be possible for well under $100,000, using Forest Service cost estimates. That is a relatively manageable amount that could reasonably be funded from an annual Mount Hood National Forest operating budget of more than $20 million. So, what’s the delay? 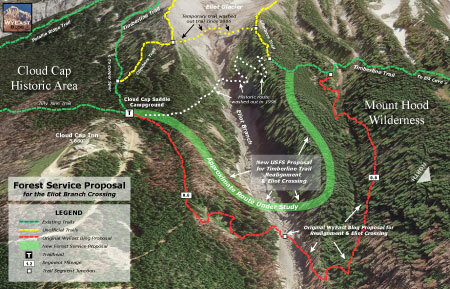 First, it’s hard to believe the Forest Service hasn’t considered an inexpensive option like the one proposed here. Yet, no such project has been formally proposed by the agency. It’s also possible that the Forest Service is still fixated on the more dramatic, elaborate fix described by forest officials in 2010. Such projects are known to bring political favor back at the USFS headquarters in Washington D.C. for their “wow factor” over more mundane projects, after all. Unfortunately, such a project does not appear in the Forest Service schedule of proposed actions (SOPA) where a proposal of that scale would almost surely have to be listed. A third possibility is that the Forest Service is holding the trail hostage in protest to budget cuts that have affected most federal agencies over the past several years. 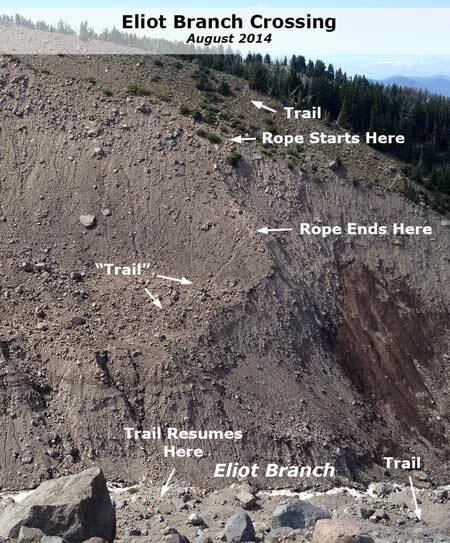 While this might seem far-fetched, consider that Oregon Congressmen Earl Blumenauer and Greg Walden made a much-publicized 4-day trek around the Timberline Trail in July 2005 to highlight issues facing the mountain, just one year before the Eliot Crossing washed out. 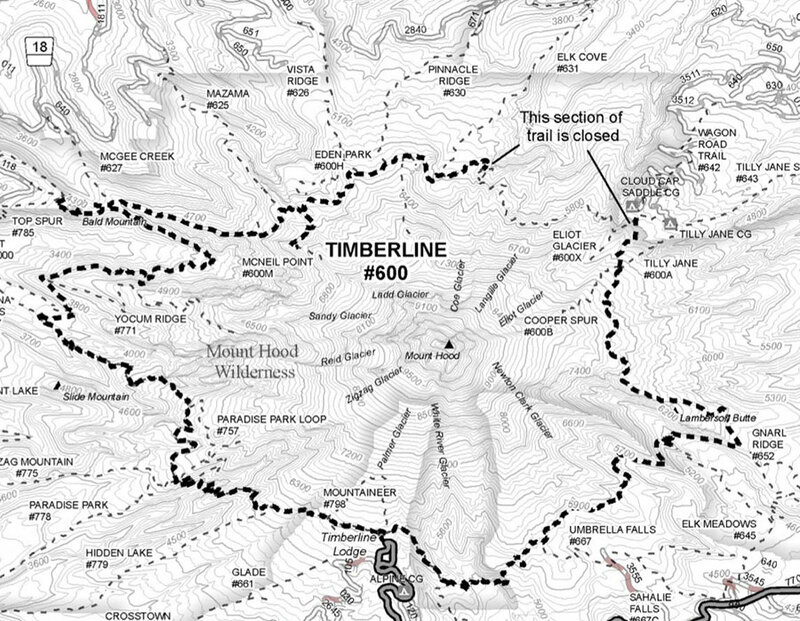 Whatever the reason, fixing the Timberline Trail doesn’t seem to be a real priority for the Forest Service. 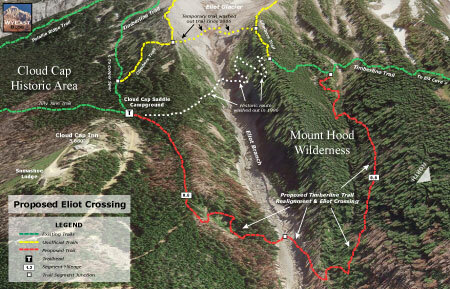 Why else would the most important trail in the Mount Hood National Forest have languished for the past eight years? In that time, the agency has spent tens of millions on other forest projects. The sad saga of the Timberline Trail closer at the Eliot Branch is also another reminder of just how different the situation at Mount Hood might be if it were under National Park management… which is the much better solution in the long term. Special thanks to Tim Burke and Melinda Muckenthaler for use of your photos – and for some of the most amazing waterfall exploring anyone has ever done on Mount Hood!